IgE and FcεR1α expression in human atherosclerotic lesions and in human macrophages, SMCs, and ECs. 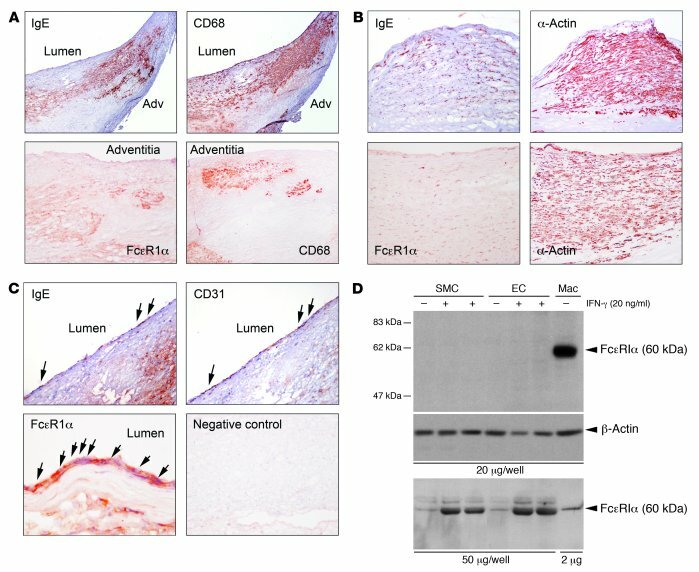 (A) Localization of IgE and FcεR1α in CD68+ macrophage-rich areas in human atherosclerotic lesions. Original magnification, top panels: ×40, bottom panels: ×100. Adv, adventitia. (B) Localization of IgE and FcεR1α in α-actin–positive SMC-rich fibrous cap (top panels, ×100) and media (bottom panels, ×100). (C) Localization of IgE (×100) and FcεR1α (×400) in luminal ECs (CD31, ×100) (arrows). Antibody isotype control was used as a negative control (×100). (D) FcεR1α immunoblot analysis in human monocyte-derived macrophages (Mac) and in HuSMCs and HuECs treated without (–) and with (+) inflammatory cytokine IFN-γ. Each lane contains 20 μg cell lysate (top panel). Actin immunoblot ensured equal protein loading. Bottom panel: 2 μg of human macrophage lysate and 50 μg of HuEC and HuSMC lysates to enhance the detection of FcεR1α in SMCs and ECs. IFN-γ (20 ng/ml) induced FcεR1α expression in SMCs (lanes 2 and 3) and ECs (lanes 5 and 6).